Windows 10's blurring of physical and digital barriers is inching closer towards reality. Microsoft's Windows 10 Mixed Reality headset partners—including Acer, Asus, Dell, and HP—were at the Build 2017 conference this week talking up their hardware. The initial models will also be priced at $399 or less, which is significantly cheaper than gaming-centric virtual reality headsets like the Oculus Rift and HTC Vive. 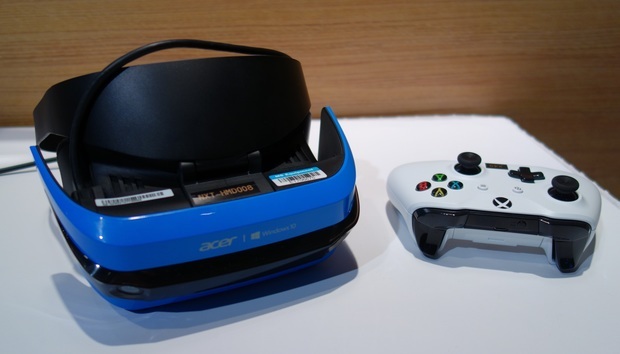 The new Windows 10 headsets are expected to start rolling out in the summer in the form of "Developers Edition" headsets by Acer and HP, with a wider consumer release scheduled for the holiday season. That's the plan, anyway. At one point Microsoft hinted that these headsets would launch a lot closer to the April release of the Windows 10 Creators Update, so who knows if we'll see more delays? Nevertheless, with those developer kits now available for pre-order it looks like the headsets are finally coming. If you're planning to pick-up a headset in the coming months, you'll want to make sure your PC is capable of supporting it. Windows 10's Mixed Reality VR controllers look like the Vive's wands and Oculus Touch had a baby. Since these specs are a few months old they don't take into account AMD Ryzen processors, which didn't exist at the time. Ryzen 5 CPUs align with the Core i5 chip and should work fine, we'd imagine. The more recently announced minimum specs for the developer editions of the mixed reality headsets, however, do say developers will need an AMD Ryzen 7 1700 or better. Overall, the developer requirements are much higher than the consumer recommended specs. That's to be expected as developers typically need greater computing power to create these experiences than consumers who only need to execute them. Developers will need the following hardware or better: an Intel Core i7 with six cores or more, or an AMD Ryzen 7 1700 (8 core, 16 threads). For GPUs, developers need an Nvidia GeForce GTX 980, GTX 1060, or an AMD Radeon RX 480 (8GB). Developers also need 16GB of RAM, at least 10GB of storage, Bluetooth 4.0, and one USB 3.0 standard port for the headset. The story behind the story: These developer specifications more or less align with the basic requirements to run an Oculus Rift or HTC Vive headset. While it's tempting to wonder if Microsoft's had to come to grips with reality and beef up the basic specs for the headsets, it's probably too early to go there. Nevertheless, we'll be keeping an eye out to see if Microsoft's basic consumer specs shift at all between now and the summer.